A well-known feature of Art Sparks’ studio is our industrial spin art machine. The children who spend time in our studio have developed an enthusiasm for the layered, colorful and subtle designs they create as they place and blend paint onto a canvas that rotates at a high speed. The anticipation of the surprise result, and the vibrant, one-of-a-kind designs created in this process bring much joy to each participant. Spin art, therefore, will be the key element in our ox design, and Art Sparks’ families will play in integral part in creating the elements for the ox. Our “VortOX” will contain the following elements in its design: Each participating artist will create multiple circular spin art designs, in various sizes, on white Tyvek. All paint used for spin art will be light-fast liquid acrylic, and suitable for outdoor use. The Art Sparks artists will use brushes to apply a base color of violet to the ox, and paint iridescent gold acrylic on the horns, tail-tip, nostrils and hooves. 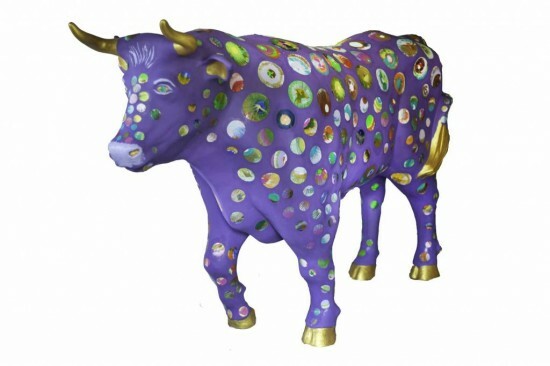 The spin art designs will be adhered to the ox’s body in an arrangement of varying sizes of “spin-art” spots.